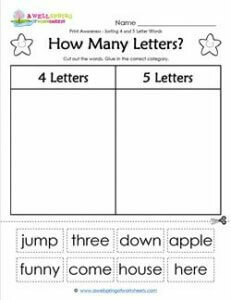 Our print awareness – how many letters worksheet has 5 and 6 letter words that kids cut and glue in the correct category. Mixes concepts of print and counting. The eight words are: jump, three, down, apple, funny, come, house, and here.